“Ah! Look at them!” I remarked. 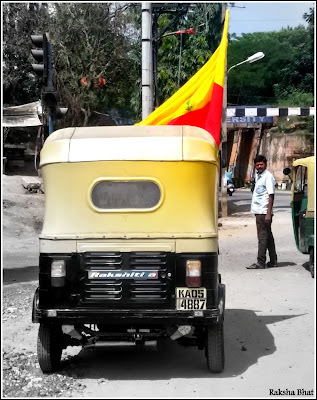 “Today is Kannada Rajyos…ttttava magale” Appa said, as always never getting it right. Any ‘Utsava’ is always an ‘Ustava’ for him and I like making him say that. No matter how hard we try at home to correct his pronunciation he does not get better. I find it cute, his tongue rolling problems! This was on our way back home this afternoon; a caravan of auto rickshaws was passing by us. 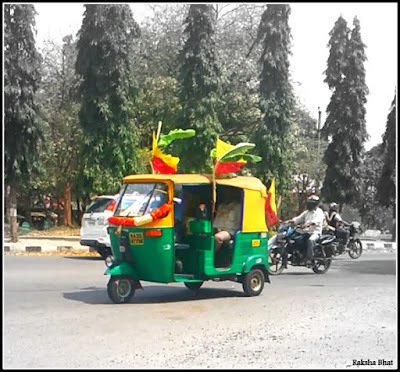 When it comes to auto drivers in Bengaluru, there are two things one can always associate with them. Firstly their immense love for the veteran actor and director Shankar Nag which in a way defines the idea of fandom, secondly the de facto flag of our state Karnataka which flutters on their autos with much passion and pride. Come first of November and the entire city is painted yellow and red, to add to the revelry we have the iconic song of our Annavru, Dr Raj Kumar which is nothing less than an anthem. I know you are already humming it as you are reading this! ‘Huttidare Kannada naadali huttabeku’ I must have heard it a dozen times today and definitely have sung a line or two along. One cannot resist it I tell you. He did not seem any less of a Kanandiga to me.